A complete meal in a bowl - this soup is an ideal dish to keep out the cold on a chilly day. Heat the oil in a large, heavy-based saucepan. Sauté the garlic and leeks for 4-5 minutes until starting to soften but not colour. Add the potato and vegetable stock, stir and bring to the boil. Reduce the heat, cover and simmer for 15-20 minutes until the vegetables are tender. Purée to a smooth consistency using an electric hand blender or food processor. Stir in the beans and half of the parsley and allow to heat through. Just before serving, preheat the grill to high. Place the slices of bread on the grill rack and grill one side for 30 seconds - 1 minute. Turn and grill the other side until golden brown. Turn again and sprinkle each slice with a little of the grated Cheddar. Grill for 1 minute or so until just melted. Stir the remaining cheese into the soup. 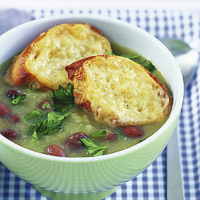 Serve the soup in deep bowls with 2 cheesy croûtes floating in each and a pinch of parsley. Try melting other types of cheese onto the croûtes, such as goat's cheese or a mature double Gloucester. The ripe, melon flavours of a Chilean Chardonnay would complement this soup perfectly.